Eighteen-year-old Darcy Patel can’t believe the dream is really happening to her. Her novel has been picked up by an agent, and a publisher. She’s received a huge two-book-deal advance. She’s moving to NYC. She’s going to be a real author. Lizzie is the only survivor of a terrorist attack in the Dallas airport, but the attack leaves her with more than just psychological scars. Her near-death experience turned her into a psychopomp, a collector of souls with access to the Afterworld. She has to figure out how all this works with the help of a very hot millenia-old Indian psychopomp, the ghost of her mother’s murdered childhood friend, and a creepy old man who enjoys ripping up ghost-souls. The catch? Lizzie doesn’t actually exist. She’s the protagonist of Darcy’s forthcoming book, Afterworlds. Oy. October must be my month of reading-books-by-beloved-authors-and-not-enjoying-them-as-much-as-previous-books-by-said-author. Afterworlds was a solid book. There were many good things about it. I loved watching Darcy try to simultaneously navigate the publishing world, her first relationship, and the perils of becoming an adult. I also loved reading Lizzie’s story – in alternating chapters with Darcy’s – particularly because the narrative sounded like Darcy’s writing rather than Westerfeld’s. He captured that brand-new-writer, first-ever-book feel perfectly, and also managed to make the narrative sound the way Darcy spoke and thought in her sections. That is really difficult to do, and props to Westerfeld for pulling it off. So why was the book disappointing? Well…because I couldn’t figure out the point of it. When I first heard of this book, I knew it was going to alternate between Darcy’s and Lizzie’s stories. I thought there was some reason for this, that Darcy would discover that Lizzie was a real person, or Lizzie would be aware that her story was manufactured, or Darcy would write something into Lizzie’s world only to have it start happening to her. Something. Something that tied the two together. Certainly, Darcy’s story was tied to Lizzie’s, in that she spent a lot of time rewriting, and worrying about things like using her parents’ religion to make a love interest, etc. But Lizzie’s story was not affected by Darcy’s at all, except the fact that she was written by her. There was a relationship between the two, but no interaction, if that makes sense. In the end, it just seemed like two books, side by side, both interesting enough on their own, but with no real reason to be put together into one. I feel like I’m missing something, I guess. Because again, the stories themselves were interesting. I was far more interested in Darcy’s, probably because I’m a writer myself, but I enjoyed both. 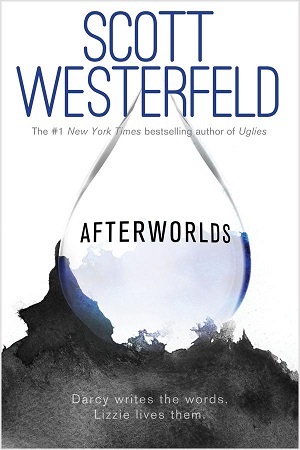 I just didn’t feel any real coming-together of the two narratives, and that prevented me from getting swept away like I have with Westerfeld’s books in the past, which in turn left me a bit disappointed by the end. This entry was posted in 2014, Prose, Young Adult and tagged divinity, LGBTQIA, POC, psychology. Bookmark the permalink. I loved Uglies, but this sounds like it would annoy me. It doesn’t come together? No point to the alternating stories? No overlap at all? I can’t wrap my head around that. I couldn’t get into the Uglies series so Westerfeld and I aren’t on good terms as is. I still think I need to retry that one though since so many loved it. I really loved the Uglies series, and just about everything else he’s written. I love his writing style. I just don’t think I really understood this one.